In case the Taliban were to take over the reins of power once again, Russia, India and Iran would need to revive their cooperation to back up a grouping in Afghanistan which could serve as an antidote. With the countdown beginning for the pulling out of international forces from Afghanistan, New Delhi is left with an eerie scenario of Taliban getting back the levers of power in the war-ravaged country. For India, this represents a disturbing proposition since it was during the time the Taliban was in power in Afghanistan (in December 1999) that an Indian aircraft was hijacked to Kandahar in Afghanistan and India had to release three dreaded terrorists in return. However, after the overthrow of the Taliban regime, India has regained precious lost ground in Afghanistan and has now opened consulates in Afghan cities like Kandahar, Mazar-e-Sharif, Jalalabad and Herat. At the same time, it has paid a heavy price and has borne the brunt of terrorist attacks on the Indian Embassy in Kabul. If indeed, the Taliban takes over the reins of power in Afghanistan after international forces leave in 2014, this would mean a significant setback for India. India has a huge stake in Afghanistan and has committed around $2 billion in developmental assistance to that country, thus becoming one of the leading international donors in Afghanistan. Besides, a consortium of Indian companies (from both the public and private sector) has won the rights to invest in the Hajigak iron ore reserves in Afghanistan. India has also given scholarships to hundreds of Afghan students to study in Indian institutions and now is the time when New Delhi should be trying to reap the benefits of the goodwill it has generated. For Russia too, the return of the Taliban to Afghanistan is a dangerous proposition, since that is likely to stoke the embers of terrorism in Chechnya, Dagestan and other parts of Russia. A Taliban takeover in Afghanistan would also impact stability in Central Asia, which would ultimately impact Russian interests. So, in what ways can Russia and India cooperate in post-2014 Afghanistan? For starters, it was Russia and India (along with Iran) who played a key role in tacitly backing the anti-Taliban Northern Alliance in Afghanistan which swept away the Taliban from Kabul after the start of Operation Enduring Freedom in the aftermath of 9/11. In case the Taliban were to take over the reins of power in Afghanistan once again, Russia, India and Iran would need to revive their cooperation to back up a grouping in Afghanistan which could serve as an antidote. India and Russia need to ensure the economic viability of Afghanistan. It is here that the Indian-funded and constructed roads like the Zaranj-Delaram highway would be critical since they provide an alternate access to the sea to Afghanistan. The stability of Afghanistan is also critical to the safety and security of the planned TAPI (Turkmenistan-Afghanistan-Pakistan-India) pipeline which will bring natural gas from Turkmenistan to India and is scheduled to be operational by 2017. Moscow and New Delhi also need to pool their resources with countries which have much to lose in case the Taliban were to come back to power in Kabul, which would include the Central Asian countries and China. Indeed, the withdrawal of international forces from Afghanistan would make the Chinese province of Xinjiang, vulnerable to further attacks. Already the province has been affected by violence and the ramifications of the same can be seen in cities like Kunming where there was a deadly knife attack. China also has significant economic investments in Afghanistan and would stand to lose a lot in case the Taliban were to take over the country. Besides, Russia and India can also help engage and stabilize Afghanistan through organizations like the Shanghai Cooperation Organisation (SCO) where Russia is a member while India and Afghanistan are observers. There are various scenarios that are possible in Afghanistan after the western troops leave. There is a possibility that some western forces would stay back in Afghanistan even after 2014 although the present President Hamid Karzai has refused to sign a security deal that would let some US troops stay in Afghanistan after their current mission ends this year. The Taliban would most likely control the major part of the country and India has to come to terms with this fact. With the Western countries interested in keeping alive a channel of communication with the Taliban as reflected in the opening of a Taliban office in Doha, India too should take the cue and keep open its channels of communication with the Taliban. At the same time, it would be naïve to assume that Pakistan would not try to once again prop up the Taliban as an anti-Indian front. 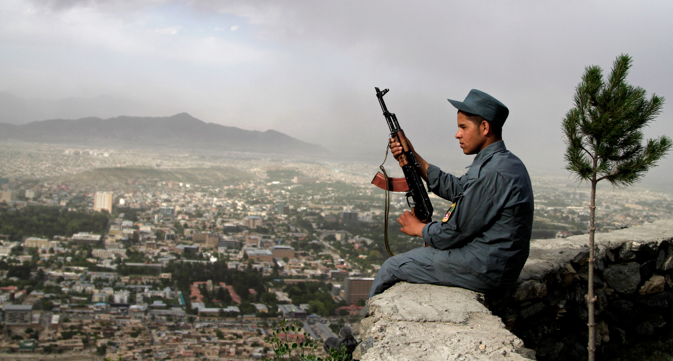 India would need to go for innovative diplomacy when it engages with Afghanistan post-2014. In the interests of its own national security, it will need to make certain concessions. New Delhi will also have a new government soon. Afghanistan is too important for India’s own national security interests and hence cooperation with Russia in stabilising Afghanistan is the best option for India at this critical juncture. Dr. Rupakjyoti Borah is an Assistant Professor of International Relations at the School of Liberal Studies, Pandit Deendayal Petroleum University, India. The views expressed are personal. His Twitter handle is @rupakj.